The international HISER conference took place at TU Delft from 21 - 23 June 2017. The gathering brought researchers together with experts from the business community to share ideas, showcases and knowledge in the field of recycling and management of construction and demolition waste. Currently 461 million tons per year of (ever more) complex construction and demolition waste (C&DW) are generated in the European Union. The average recycling rate is around 46%. There is therefore still a significant loss of potentially valuable minerals, metals and organic materials all over Europe. Several initiatives are ongoing around the world to develop methodologies and technologies to turn these waste streams into resources for the benefit of the economy and the environment. The conference intended to provide researchers and industry experts with the opportunity to exchange their ideas and showcases in advanced/innovative technologies and methodologies to process and valorise C&DW in the context of the circular economy. Among them, the EU funded HISER project (www.hiserproject.eu) which aims to develop and demonstrate novel, cost-effective technological and non-technological holistic solutions for a higher recovery of raw materials from ever more complex C&DW, by considering circular economy approaches throughout the building value chain (from end-of-life buildings to new buildings). Francois de Larrard is the research director of the world’s largest cement company, LafargeHolcim. He revealed that LafargeHolcim has built a number of infrastructural works out of recycled concrete and that, occasioned by the positive experiences, the company has decided to implement the large-scale launch of recycled concrete on the market. The company has an English language publication to explain all the relevant issues concerning recycled concrete to engineers. Part of the conference involved a visit to the industrial site in Hoorn where TU Delft in collaboration with Strukton/GBN and Mebin/Heidelberg has developed concrete recycling technology with funding from the European Commission (projects C2CA, HISER, VEEP). All pictures are available on this website. On this picture: organiser Francesco Di Maio (left) and Prof.dr. 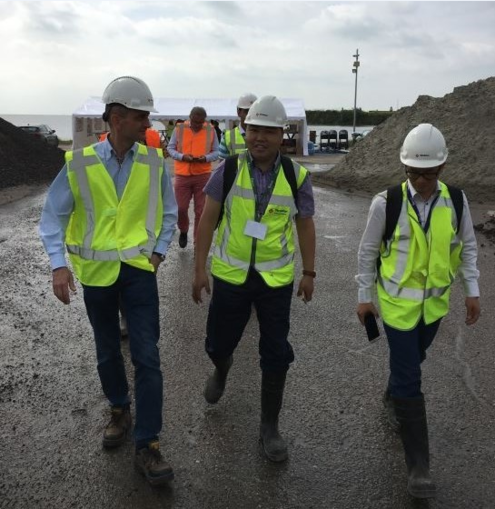 Jian-Zhuang Xiao of Tongji University (middle at the industrial site in Hoorn).